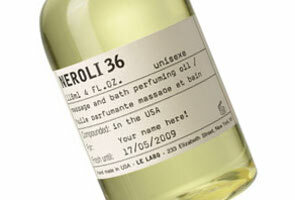 Today Marlen and I are discussing Neroli 36, one of the 10 fragrances launched by Le Labo this year. The unisex fragrance was created by nose Daphne Bugey, and features neroli, mandarin orange, rose, jasmine, calone, musk, tonka bean and vanilla. He says: Being a fan of all things neroli/orange blossom, I consider myself a pretty harsh critic. But I gotta say — Le Labo Neroli is…wow! Floral and somewhat powdery, with undercurrents of marine notes, Neroli’s mélange of rose, jasmine, musk, vanilla, mandarin and neroli is a breath of fresh air, grander than the typical eau de cologne and more complex than a mere single note floral. I’ve read of comparisons to Frederic Malle’s En Passant, and I’d have to agree, though the doughy iris notes and powdery lilac have been replaced with vanilla and a jasmine/rose pairing. I like the way the scent moves through its development, starting with wispy and light before moving to something sweeter and fuller-bodied, no doubt owed to the blossoming of the vanilla note. Reminding me of Hermès’ 24 Faubourg Eau Delicate with its soft floral tones, I have a feeling that this may not be as popular with the gentlemen as say, Rose 31 will be, but any serious lover of orange blossom fragrances should check this out as a surprising and mellow alternative to the standard designer fare. She says: Le Labo is one of the bright spots in what has seemed to me to be an otherwise largely dull year for fragrance, and I am especially fond of the other two Daphne Bugey fragrances for the line, Rose 31 and Bergamote 22. And, like Marlen, I am a huge fan of all things orange blossom and neroli. But Neroli 36 failed to charm me. It is a clean and fresh rendition of neroli with, as Marlen points out, distinct aquatic undertones and a dollop of vanilla sugar in the dry down. There is nothing particularly bad about — it is a bit flat, but that is not always a bad thing — I just don't find it at all compelling, and something in the far dry down smells almost stale to me. I wish I had a more eloquent explanation, but I don't: all I can say is that I've tried it a handful of times, and never once was I moved to grab the credit card. Given how many others I like from Le Labo (I'll add Patchouli 24 and Vetiver 46 to the list) it is just as well. Addendum: as I was finishing the formatting of this post, my husband walked in and asked what that wonderful smell was. De gustibus non est disputandum. For buying information, see the listing for Le Labo under Perfume Houses. I will side with R. on Neroli. It is somehow flat and uninteresting. I wished for something more radiant, I suppose. V, 2nd all of that. LOL at “It just sat there on my skin and bored me”. Rather long for an acronym (IJSTOMSABM) but it could handily replace half the blather of my posts. And by the way, I am very impressed with the Latin thing, R! In junior high, I could barely get past amo, amas, amat, amamus, amatis, amant. LOL! Ah, another we agree on, M! I think it's called “Fleur De Lis Perfumes”, in case the link doesn't work. I liked this enough to purchase it as one of my three choices in their discovery set. I wasn't my favorite of the three (the “evil” Vetiver 46 was). However, I took the sample with me to FL & my sister absolutely adores this. It smells wonderful on her, very prominent orange blossom and it lasts more than 24 hrs on her. She's gotten quite a few compliments & considering she's a firefighter/paramedic & works with all men….that's saying A LOT! Neroli 36 is a definite purchase for my sister. I like the “evil” Vetiver too! But Bergamote, Patchouli & Rose are my favorites. All in all it is a great line.